The Panasonic LUMIX DMC-FZ1000 premium snapper takes over from the Panasonic FZ200 as the brand's flagship bridge camera. Like the brand's excellent Panasonic GH4, the FZ1000 features 4K video capture - a first for a compact camera. You can also take stills from the 4K footage - almost like having an ultra high-def shooting mode. Well suited to outdoor photography, especially snapping wildlife, the camera boasts a meaty 16x zoom along with a Leica lens with a F2.8-4.0 aperture. Inevitably for a camera with a zoom of this size, the FZ1000 is not exactly pocket-sized, in fact, its build has more common with a DSLR, although it's still smaller and much lighter. In fact, we found the grip to be very comfy, even when we were carrying the camera around. The chassis feels sturdy and while we wouldn't recommend dropping it, it felt like it would take a few knocks on the chin. The new model has plenty of new features including time lapse and stop motion capture, and focus peaking to help with manual focus. You'll also get a zippy burst rate of 12fps along with a fast auto focus with the AF aread being increased from 25 to 49. We certainly found the AF to be very quick during our initial hands-on. The camera also has Wi-Fi and NFC to enable remote shooting from your mobile device plus some editing options. The 3-inch LCD screen has a respectable 921k-dot resolution and performed well, even it bright sunshine. And when the sun got too bright for the screen we were able to switch to the built-in OLED viewfinder which was large and impressibley clear. The 20.1MP 1-inch MOS sensor is around four times larger than the 1/2.3-inch sensor found in most rivals, so picture quality should be of a high standard.A arger pixel size means that more light can get through so that the camera is well suited for dimly lit conditions as well as a better bokeh effect. As well as the new sensor, Panasonic's upgraded Venus processing engine should offer better colour reproduction and gradation. We reeled off some test snaps during our time with the camera which all looked very clean and free of noise, but we'll be looking at this more closely as soon as we can get our hands on a full review sample. Panaosonic has also introduced more monochrome filters plus other new effects. 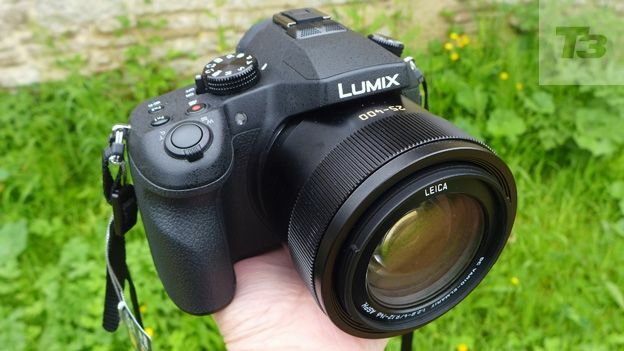 Our first impressions of the Panasonic FZ1000 were good. The 4K recording may seem like overkill, especially for those without a 4K TV, but the ability to take stills from any 4K footage has incredible potential for shooting moving subjects.